Thinking about hiring a wedding planner? Our friends at The Daily Meal evaluated event-planning companies across the country to curate the best of the best — the planners who are setting trends and making an impact on the wedding industry. Find the top planner in your state! Christopher Confero is a creative genius at his craft; with expertise in lighting, graphic, and floral design, there is no space he can’t transform into a magical setting. Connie Tracy and Andrea Engbretsen are intent on creating memorable experiences and events that are reflective of the couple, the brand, or the occasion at hand. Ara Farnam and team consider themselves event designers, bringing the aesthetic of interior design to each event, one tabletop, rental, and arrangement at a time. Ashley Henderson is known for her unique outlook and whimsical flair, she specializes in affairs of all sizes. Bash, Please is full-service production and design house, that is not only taking the California party scene by storm, but also the world, since they'll travel around the globe to create custom soirées anywhere you want. Marrying old traditions with new ideas, the company can create high-impact yet sentimental and personal events and experiences. Specializing in eclectic events, from farm dinners to tented affairs, Jubilee Events, made up of a trio of women, is well-versed in the art of the party. The team at Make My Day pride themselves on bringing the vision of each and every client to life. With three types of packages named The Glam, The Glitz, and The Glitter, Posh's founder, Heather Lowenthal, is bringing a certain panache to every event she curates. Aside from creating dramatic affairs, Graham and her award-winning team not only provide week-of exclusivity to your event, but they provide with you consultations leading up to the event and handle all issues, both major and minor, to ensure a memorable occasion. Season of Life Events' various types of coordination, from full-service packages for destination couples to day-of wedding coordination, help you execute your vision. With a background in creating floral arrangements and coordinating high-profile Beverly Hills events, Taylor Sturges brings big-city professionalism to Sun Valley, Idaho. Katie, Kara, and Renny have recieved widespread praise for their whimsical and fun attitude in planning every detail of an event. Her background as a mental health specialist in the National Guard gives April a unique knack for combating the stress of curating events and dealing with difficult situations that might arise. 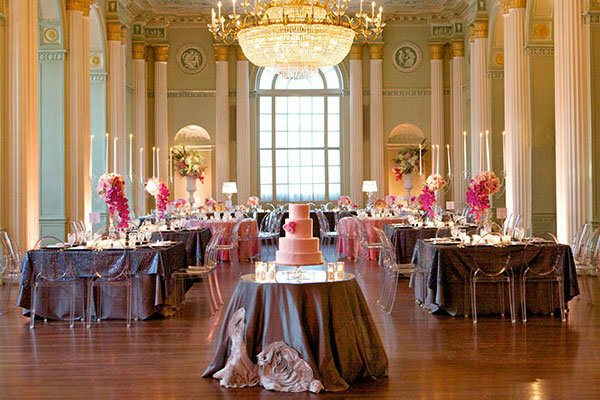 Nona Via will help you coordinate, execute, and budget everything for your big day. Offering everything from budget planning to etiquette lessons, the ladies at Simple Elegance will help you coordinate your big day down to the last detail — whether it’s a black-tie affair or a rustic intimate setting. Viva Bella is all about making memorable moments — they pride themselves on sensational professionalism and thorough imagination. Plan B seeks to play up the city's charm in their events; from sourcing photographers to coordinating a Bourbon Street parade, they certainly bring life to the party. When you choose Sweetest Thing, you're getting dream makers — two women who really know what they're doing and want to make you happy. A boutique event planning agency, Simple Details Events focuses on the posh and the high-end, letting no detail (large or small) go unnoticed. Hey Day is a full service event lab catering to all your creative design needs. Their a la carte menu allows you to create the perfect package that fits your budget. With a flair for the dramatic, Faith O. Folayan and company think of creating magnificent events as bringing art to life. Shanna Lumpkin Events was born from a bridal boutique, A Southern Affair, and has now flourished into a household name in Mississippi. From building inspiration boards to executing the most important details on your special day, Simply and Forever has planning down to a science. Anita Pagliaro uses indigenous and local materials to set the scene for an unforgettable experience — so much so that after seeing these "environments" at events, couples often ask for her aesthetic advice when designing and decorating their homes. Candace Kalasky knows there’s much more to events and weddings than coordinating where everyone should be at any given moment during the big bash, which is why she focuses not only on the art of planning, but on designing as well. With more than 20 years under her belt in the world of entertaining, Felicia Gantar puts her knowledge to use for every event, looking at each one as a blank canvas and a new opportunity to bring something special to the table. After planning her own big day, Leslie Barbini used her personal experience to begin assisting close friends and family with their own nuptials. With the resources of both New York City- and New Jersey-based vendors, this company is an unstoppable force. Born out of the combined success of celebrity events and the founder's time as a private chef (plus a love of weddings), Soirée is thriving and making couples and clients happy, one event at a time. The company prides itself on its mix of vintage finds and fresh-faced artistry and uses the inspiration of happy couples to make each event or wedding come alive with a certain pizzazz. Ivy Robinson's brand is based on bold colors, strong patterns, and a heavy emphasis on menus. The creation of Bliss was inspired by owner/coordinator Alicia Weigel’s own wedding. She believes every event should be a stress-free and blissful experience. Something Blue was built on the idea that a truly successful event is a result of teamwork, which is why this firm has a tight-knit connection of vendors and planners that they use to make every event a memorable one. A self-described "girlie-girl" with a background in dance and cheerleading, Christina Leigh knows the true essence of a bride’s dream. Whether she's working with an extra feminine bride or a minimalistic one, she’s got it covered. Since its inception in 2008, the firm has been praised by industry experts and insiders as a top choice for any Oregon couple. This Philadelphia-based event and wedding planning design firm's client list reads more like a Hollywood who's who than it does a list of party guests — past events have featured famous faces like Elton John, Vera Wang, Elizabeth Taylor, Gregory Peck, Luciano Pavarotti and more. It’s safe to say this firm can handle the big leagues. With more than 25 years in the business, Exquisite Events of Newport is experienced at putting on local and destination events, both large and small, as well as coordinating flawlessly on the big day. From the preliminary consultation to parting favors, the team at WED has all of the bases covered with a big-city mindset and a boutique flair. With a knack for vintage finds and innovative style, Envision specializes in the art of invitations as well as props for your big bash. This Dallas company creates a true couture experience, letting each client decide what they need, whether it's an à la carte service or the full package. Starting with a concept, Jessica Sloane draws up a blueprint before diving into the details, from floral design to paper choices and all the important specifics in between, to make the day as special as it can be. Events by LMG is the premier stop for couples looking for exceptional service; they have a stellar reputation for theatrical ambiances created by a team of experts. With their love of entertaining and the gorgeous setting of Vermont as a backdrop, Storied Events produces stunning events every time. With a near-never-ending list of services, from full planning to month-of coordination, Roberts & Co. Events will be there in whatever capacity you need them to be, every step of the way. As a full-service event planning firm, Perfectly Posh can assist you in any way you need, with everything from planning packages to advice sessions on offer. Inspired by the iconic "little blue box" at Tiffany's, Blue Box specializes in the lavish, opulent, and over-the-top; they certainly know how throw a no-holds-barred bash. With a savvy minded team, this firm can create a wedding that works with any budget. With a resume that needs an accompanying passport, Emily Campbell has executed events in over 40 countries and 5 continents before stationing herself in Colorado and planning weddings in surrounding states, like Wyoming.